What gets noticed gets done! A crucial aspect of leadership is consistency especially in reward and recognition. An example of this is well-explained in the following extract from ‘Mutiny on the Bounty’. Captain Bligh was in fact a brilliant leader but only in certain contexts and situations. His major flaw was his lack of consistency. There were a number of things about him that were already causing a measure of uneasiness – the uncertain nature of his moodiness, the way he would nag, nag, nag away on some failure, real or supposed, large or small, one day, then ignore a serious piece of management the next day. There wasn’t any consistency about the man. 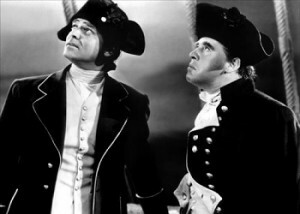 Captain Bligh and Mr Christian – Richard Hough. Praise is an invaluable aspect of keeping people motivated and to positively recognise and reinforce good behaviour. However praise has to be served up consistently and in the right way for it to be effective. There is a scene in the British TV sitcom series “Are You Being Served” where old Mr Grace, supported by an attractive nurse, would get out of the lift and say to the assembled staff “You’re all doing really well”. He would then disappear into the lift, leaving the staff completely underwhelmed by his ‘management technique’! This off the cuff praise is generalised and meaningless. It is unhelpful and is often perceived by others as patronising. Praise and thanks on a day-to-day basis as an everyday courtesy helps ‘oil the wheels’ of a team. But true reward and recognition, for a particular behaviour or a specific action which encourages more of the same, is what really makes a difference and encourages high performance. We are not talking about major achievements, but any significant move in the direction you want the person to take. Change is a series of small steps, each one being reinforced little by little on a consistent basis. Negative consequences or penalties can reinforce the process so that people know what behaviour is not acceptable. However evidence and research shows that reward and recognition works better than penalties. It is positive reinforcement through noticing and remarking on behaviour that has the greatest affect. How do you manage reward and recognition for your people?